I wasn't sure if I would get a post up this week. Last week I was so busy with a new business I launched from my Facebook page I wasn't able to post. This week I planned to show the teacher's gifts my girls' teachers are getting for Christmas this year. I came down with the flu instead so I have postponed making them until I am not contagious. I didn't want to leave you without anything this week so I went through my files and found this picture of a cake I made for Christmas last year. I was very lucky to find a preschool close to me in a local church. 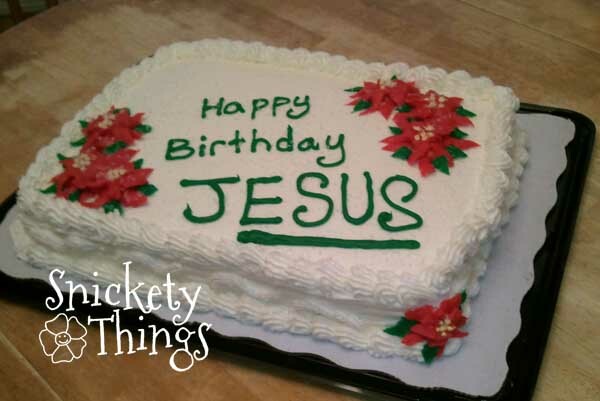 The Christmas party they do for the kids is a "Happy Birthday Jesus" party and they asked if I could make a cake to feed around 40 people. I told them sure and started brainstorming. I didn't have much time as the cake was need just a few days out. I decided on something simple. The entire cake was iced in white and I made a very thick border around it using a large star tip. You can see on the right it buckled the icing on the side a bit and made a slight bulge, but it didn't fall and I knew the kids weren't going to be inspecting it for mistakes. After all, they were all four year olds and more interested in the fact they would be getting cake. I love making poinsettias out of icing, they are super easy to make. All you need is a leaf tip. I use two different sizes, one of them one size larger than the other. Start by laying out some leaves in green with the larger tip then lay layers of red leaves on top. A round tip will let you easily apply the centers of the flowers. I always add one flower to the side of my cakes to bring the color down. I never enjoy having to write on a cake. It never seems to go on straight and this cake was no exception. I am going to refer back to the fact that four year olds don't really care. To make it look like it had ice on it I sprinkled some clear sugar crystals. I know this isn't as elaborate as some of the cakes I have posted in the past, but it was still fun to make. 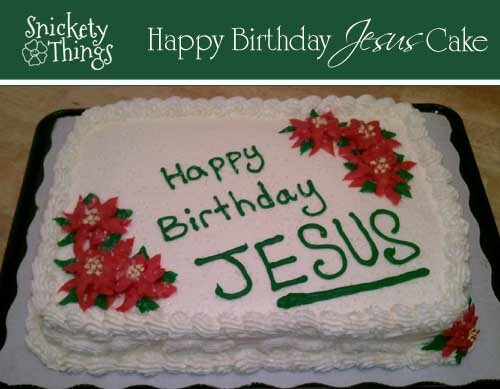 Thank you, this was the first one I have made although we do sing Happy Birthday to Jesus. Yay! I love your cake!! Thank you for linking up! 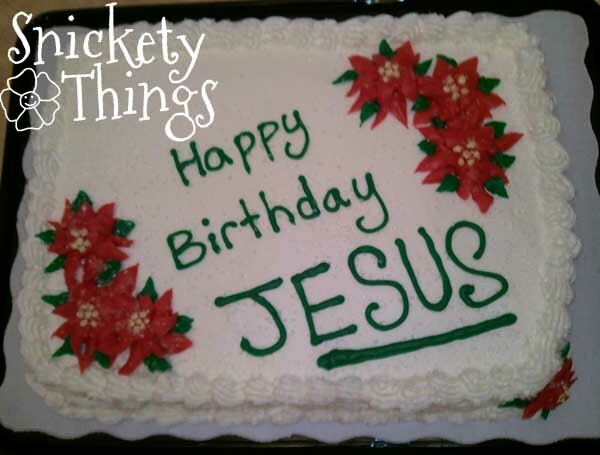 We have never made a Happy Birthday Jesus cake but I was thinking this was the year to finally make one!!! Thanks for linking up at my party!! Had to do your first one Shelley! Glad you like the cake. 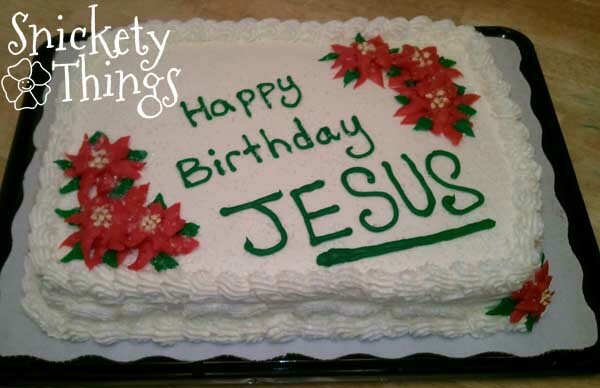 A perfect cake to celebrate the birthday of our King Jesus!